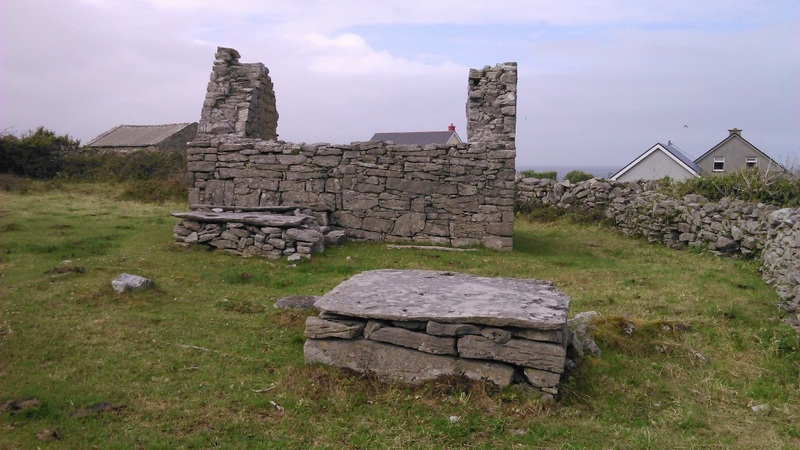 The stories surrounding St Gobnait, who is most prominently associated with Ballyvourney, hold that she was born in Clare in the 6th century and later spent time on the Aran Islands studying under St Enda. Her time spent on Inisheer (Inis Oírr), the smallest of the Aran Islands on Ireland’s west coast, marked the beginning of her life in peregrinatio. In this tradition, holy individuals, in imitation of the Desert Fathers, left their homeland and social ties to pursue a life dedicated to Christ; for example, St Fionán established his monastery on Sceilig Mhichíl and St Columba lived on Iona in Scotland. Later, following a visit from an angel, Gobnait went in search of a place to establish a church across Munster, and as had be prophesised she found a herd of nine white deer grazing at Ballyvourney. She was granted land by St Abbán and she found a community of religious women. 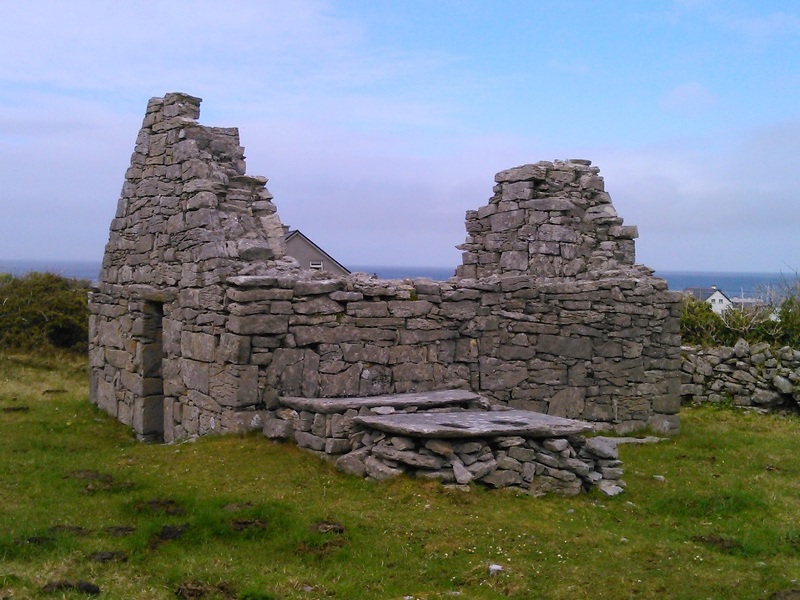 A small ruined church, Cill Gobnait, remains on the island as evidence of her time there. 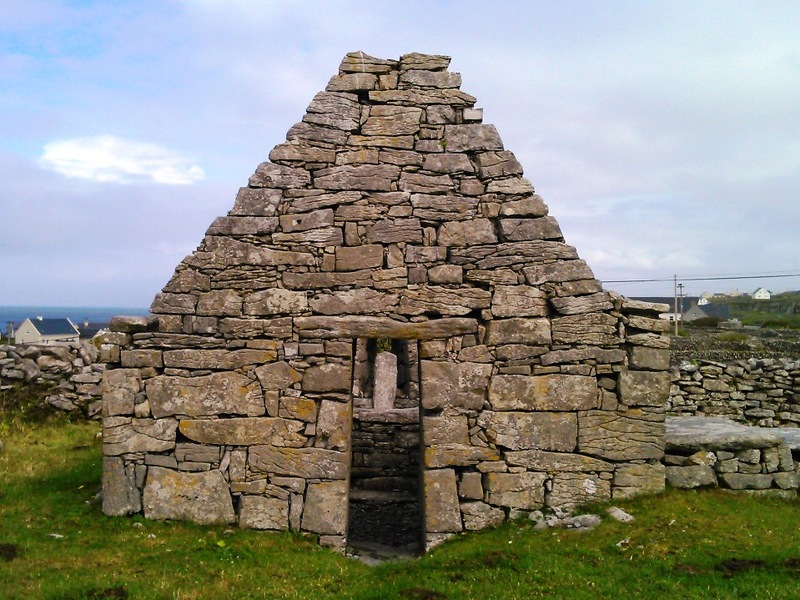 The structure is reminiscent of other oratories found in Ireland, especially older sites along the west coast. 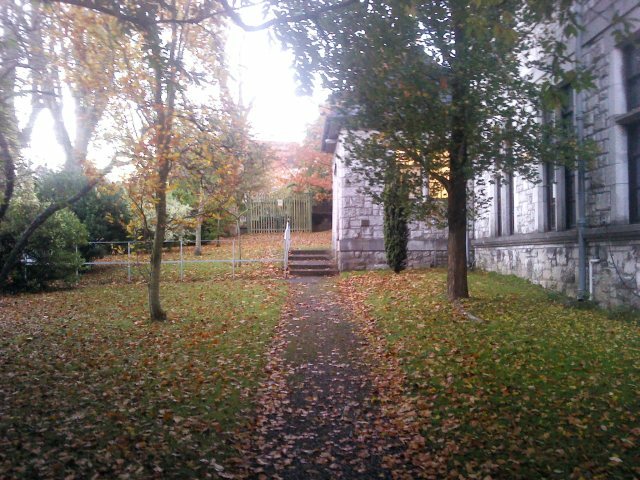 Adjacent to the church are three altars or potentially penitential stations. 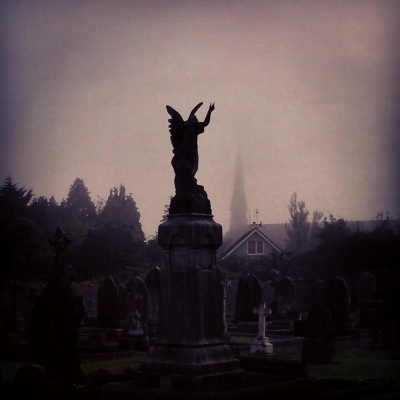 As features associated with St Gobnait, can be linked with other locations named after the saint. A network of places across Ireland, including sites in Clare and Kerry, as well as Inisheer and Ballyvourney, have a Gobnait connection. Through belief in the holy person and her journeys, a thread unties these sites. The stories of the saint and her peregrinatio are manifest in these places. Legend and history, geography and belief fold together in this spaces. My second paper at the RGS-IBG Annual Conference 2014 is part of the ‘Postgraduate Snapshots: Engagements in Social and Cultural Geography‘ session, which explores the different ways in which postgraduates are (co) producing social and cultural geographies through their research, collaborations, methods and encounters. Each participant presents a ‘snapshot’ (an image, object, media clip etc) of their research in a creative and interactive way. 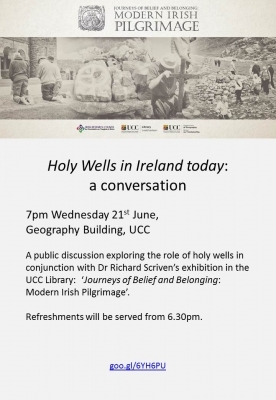 My first paper at the RGS-IBG Annual Conference 2014 is within the session Sacred Space, Pilgrimage, and Tourism which looks at sacred space through the areas of the sacred, such as pilgrimage/theology/spirituality/belief systems, and the more secular, incuding tourism/leisure/promotion/visitor behaviour. My contribution is on Croagh Patrick. In this paper, I examine Croagh Patrick, Ireland as a space that is simultaneously sacred and secular, political and recreational and of the past and present. 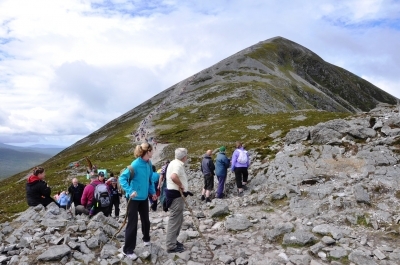 This mountain in County Mayo, which has been the location of religious-spiritual activity for millennia, serves as one of the most prominent pilgrimages in Ireland, as well as being a venue for hill-walkers and tourists. Recent engagements with sacred spaces, being influenced by phenomenological and non-representational approaches, have conceived of them as being performed or in continual a state of becoming. Using my fieldwork experiences on Croagh Patrick, I explore how the different practices on the mountain create it as a space of devotion, leisure, protest and charity in ways which can be complementary, synchronous and frictional. By focusing on the embodied spatial practices, consideration is given to how these interactions form and forge meanings, places and participants. Political Geography, Geomorphology and Economic Geography walk into a bar. Each of them is boasting about how great they are and how they do more work than the others. Political Geography explains how it deals with upheavals, coups and oppression, all the most serious and grueling of matters. Geomorphology strenuously objects! It looks at uncomprehendingly powerful forces that shape the very surface of the earth across time, that is real hard work. Economic Geography is having none of it. It insists that the volatility of the markets, and the chains of production and consumption are truly the most challenging things to study. The barkeep looks on bemusingly, when a new geography walks in. Suddenly the three geographies, each proudly boasting its merits, go very quiet and shy away to a far corner. The other geography orders a sandwich and drink, leaving soon after finishing it. The three geographies make their way back to the bar. “Hang on now,” says the barkeep, “each of you were going on about how great and tough you are, but you were all terrified of that geography! What’s up with that?” “Don’t you know?” replied Geomorphology, “That was Psychogeography!”. Tangible vapours of sky on earth which modulates perceptions with all made uncertain, close and distant. Light through moisture, glowing and fading. The approaching car, more approaching, stretch beyond itself. Blanketed, I am among it, making the familiar mysterious. St Brigid’s Crosses are small hand-crafted crosses made from reeds or rushes (or sometimes straw) which are put up in houses on 1st February to mark the beginning of Spring. They have a distinct design with a woven square centre and four radials. Similar to many Irish religious-cultural traditions, they are a mix of Christian and Pagan, with St Brigid’s feast day coinciding with the Celtic feast of Imbolc and the design seeming to blend the Christian cross with Celtic themes. The cross is put over the door or in a place of significance in a house or farm shed. 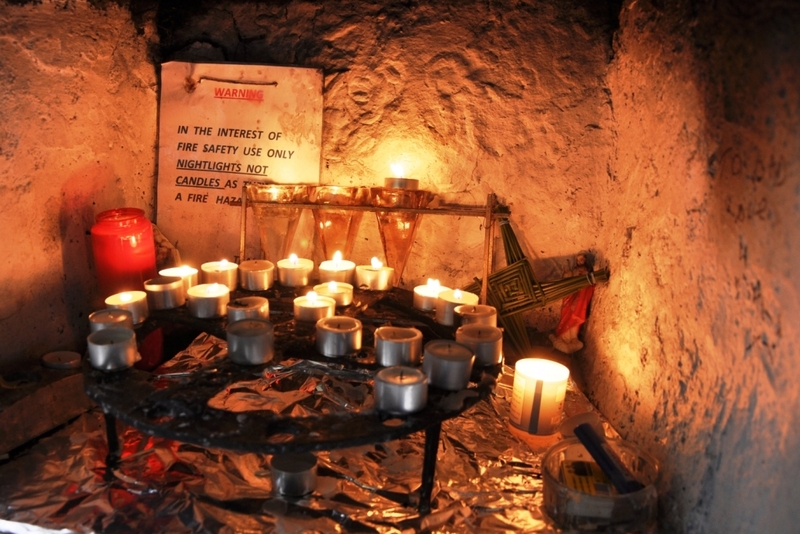 It is supposed to bring protection and is particularly associated with preventing fires. These crosses are very simple, yet beautiful objects. They are handmade every year – part of the tradition requires that the cross is replace annually, with the old ones being burned – in a continuing tradition, the result of centuries of belief and lore. They bring together the natural world, spiritual-religious beliefs, vernacular culture and the importance of the homestead. Sharing Cork was a project I ran as an experiment for Geography Awareness Week 2012. I was interested in developing an online project and engaging with social media. This year was the first time there was a Geography Awareness Week national programme being run in Ireland, with the Geographical Society of Ireland (GSI) in conjunction with the Association of Geography Teachers in Ireland (AGTI) coordinating the events. Sharing Cork was run as part of this, which assisted in its promotion. Sharing Cork was an online project which centred on my home city of Cork. It aimed to use social media to crowd-source contributions. I asked people to record (photo, video, audio recording, drawing etc) a part of their daily life and share it. Emphasis was put on the everyday angle behind the project. Participation in the project was explained as being as simple as ‘Record, Share, Enjoy’. Someone was to take a photo (or make a video, record audio, drawing or painting) of a place, activity or encounter from our daily life. Then, they shared it using email, Twitter, Facebook, or by sharing a link from a site/page where they hosted their materials (eg. youtube, flicker, wordpress, audioboo). Contributions were gathered, collated and shared in one place (via this site) for everyone to enjoy and hopefully learn from it. As well as being an interesting project for Geography Week, I intended to use it as a means of engaging with social media as a tool and to practice developing a site and online project. I consider it a success in terms of the latter motivation. I was able to use WordPress to generate a site and then link it in with social media. That link proved essential as both the Twitter and Facebook incarnations of the project generated specific interactions and contributions. 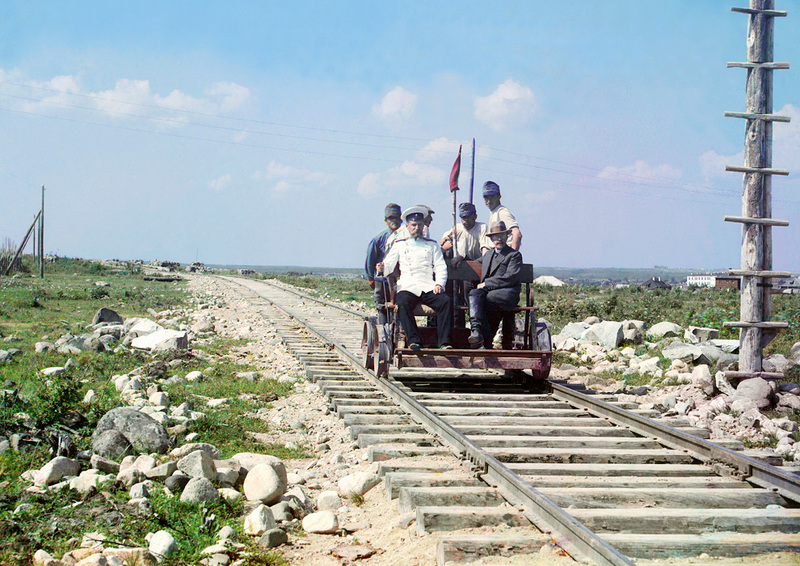 The experiment with social media was limited in its impact, but nonetheless it showed the potential for the use of these platforms in research. Overall, I was reasonably pleased with the endeavour. The technical aspects worked, I got some contributions and I am more convinced than ever about the growing role that social media and the web will play in research. Website: It received 187 views (a unknown, but sizeable portion were from me). Monday 12th Nov was the day it received the most views, with 72 hits. Facebook page: 37 Likes (15 of whom are friends of mine on Facebook); the ‘Reach’, the number of individual people who have seen a post, of individual posts ranged from 0 to 43; there were 33 posts on the page, 26 of which were by me. Twitter: The twitter account had 43 followers, with it following 125 accounts – most followers seem to respond to being followed (especially since most were Cork-based organisations or businesses who have an interest in generating and connecting with followers). The account received 15 mentions and 19 retweets, 10 of which were by me via other accounts. Start early and promote in the lead up: I developed the project late, within a few days of the actual Week, and had little time to get the word out. Engage with people and organisations that have strong social media presence: A retweet or a posting form the right person or organisation can have a significant impact. Also, contributions can be solicited from people or representatives directly. Be persistent In the ‘shallow’ online world, which has little memory, you need to ensure you have a continuing presence and relevance. 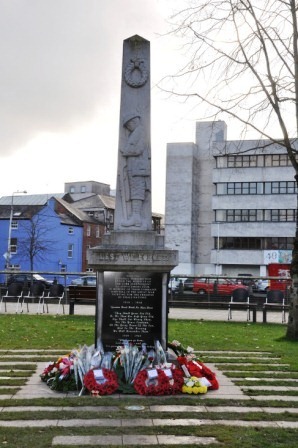 The WWI Memorial monument, South Mall, on 11th November, shortly before the commemoration event. 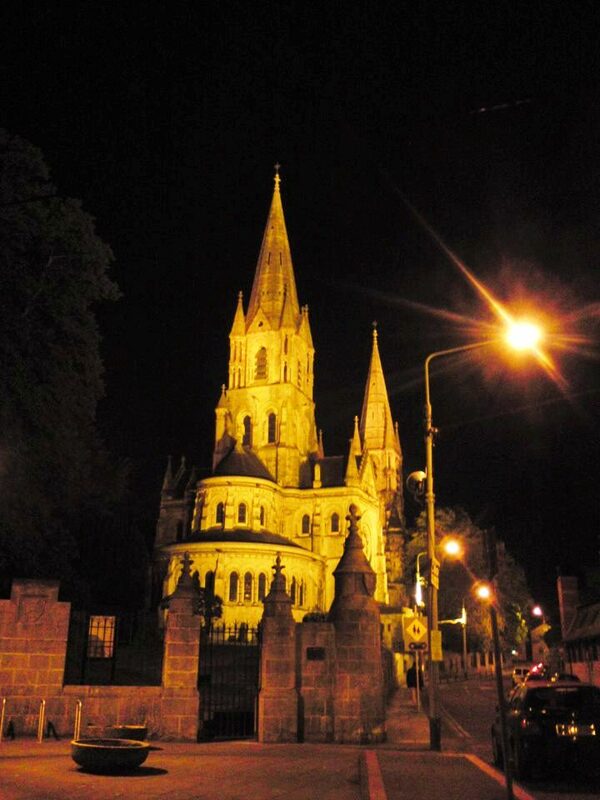 St Finbarre’s Cathedral at night. While it looks beautifully lit here, one person I know who lives close finds the constant yellow glow in the sky a disturbance… (Courtesy of S. O’Connor). 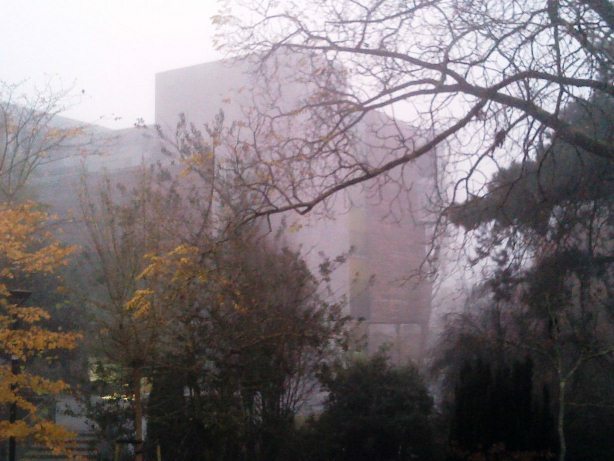 Foggy Cork, Glucksman Gallery, UCC (7.56am 15/11/12). It’s one of those foggy mornings that completely transforms the landscape, even in the city. While UCC is, in places, a green oasis within the city, this part of its character is emphasised in the fog, when visibility is limited. 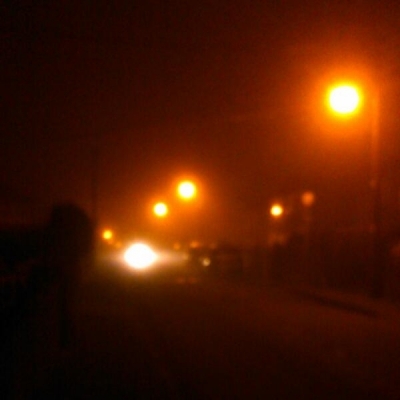 In the closeness of the fog everything seems quiet and isolated. 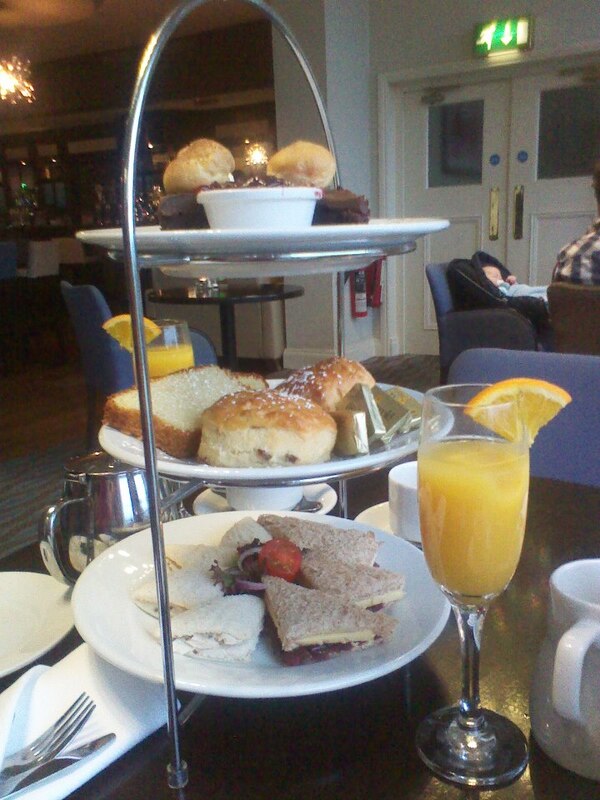 Afternoon tea in the The Montenotte Hotel #gaw #sharingCork (Courtesy of M. Murphy).